The apartment is located in a stylishly restored house in Bad Schandau in the side valley, also called Zauketal. Located directly on the mountainside with adjacent hiking trails. The rooms are the character of the house in accordance with sophisticated furnished with real wood furniture. The two apartments on the ground floor and first floor were restored in 2008/09 and are located in a house, which was built at the beginning of the 20th century. Century was built. A fireplace is located in the apartment on the ground floor. The apartment offers two-bedroom accommodation for up to 4 adults + 1 child in a travel cot. The kitchen equipment meets modern requirements and you can feel like in your own kitchen. The spacious kitchen includes a full kitchenette with dishwasher, refrigerator, stove with hotplates, oven, dishes, kitchen utensils, (...). 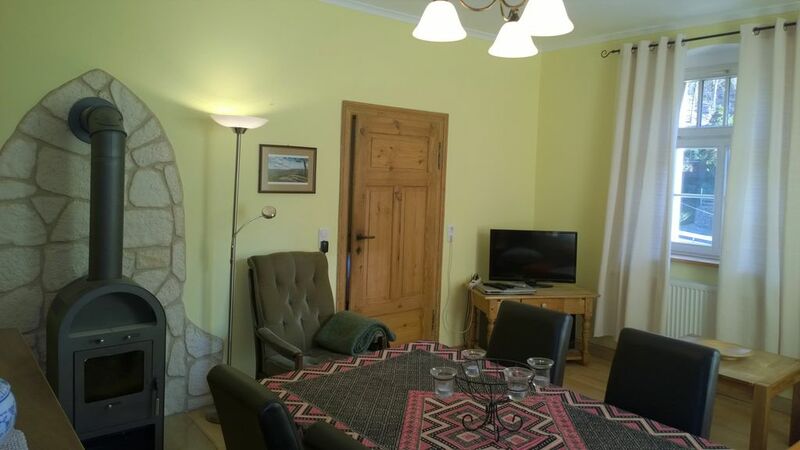 The apartment also has a cozy living room with dining table for up to 6 people, sofa and table with TV area and a wood-burning stove. Wood is available. There are two separate bedrooms, the travel cot can be set up variably. There are many games, children's books, further reading of the environment and information material. Wi-Fi available. Sheets and towels are included in the price. Wipes, cleaning utensils and toilet paper are available in sufficient quantity. Fabelhafte gemütliche und super gelegene Wohnung! Wir genossen unseren Jahresübergang in der super bequemen und vorteilhaft gelegenen Wohnung. Die Festung Königstein, die Bastei sowie die spannendsten Wanderwege zu den Schrammsteinaussichten befinden sich lediglich einen Katzensprung entfernt! Die sehr ruhige und grüne Lage überzeugt mit einem fußläufig erreichbaren Supermarkt sowie entspannt fahrenden Kurzstrecken zu den populärsten Attraktionen. Wir haben uns sehr wohl gefühlt und können die Unterkunft bedenkenlos und wärmstens an alle empfehlen; es fehlt an rein gar nix!